Here’s what tests you can expect when you’re expecting! Could your baby have Down syndrome? Are you developing gestational diabetes? Pregnancy tests can detect problems when things aren’t normal. No two pregnancies are the same; pregnancy tests and screening tools help you learn what risks and problems could affect you or your baby. Is your pregnancy considered “high-risk” because you have high blood pressure or diabetes? These health issues can cause problems in pregnancy. Knowing your risks means you and your healthcare provider can manage those risks together for the best possible outcome in your unique situation. Most of the screens you may receive can be done in your provider’s office, or at a lab or the hospital where you plan to birth. Know that any screen, test or procedure is always your choice. Screens or tests have “false positive” rates—meaning they can show positive when the truth is that you don’t have that problem or risk. For those screens or tests that carry small risks with the procedure, ask yourself what you might do with the information. If you’re not willing to act on the information, you may not want to undergo that screen or test. Discuss your questions and concerns with your nurse so that you’re comfortable with your screening and testing decisions. Screening pregnancy tests measure your risks for a problem. As you learn about your risks, you learn how to manage those risks or get extra help. For example: knowing whether your baby has a birth defect allows you to prepare for having a child with a particular problem. Maybe you’ll need specialists who work with these disorders present at baby’s birth. Maybe you need additional pregnancy tests—again, the choice is up to you. Perhaps you would not continue a pregnancy based on information from some screens—this is your choice. Keep in mind, though, that prenatal screening tests show only whether you are at high or low risk of having a baby with a particular disorder or defect. They can’t tell you whether baby actually has the problem. Diagnostic tests help detect a specific problem or provide information that helps your healthcare provider make a diagnosis—which is an explanation of the issue or problem. Diagnostic tests determine if you have or are at risk for a disease. 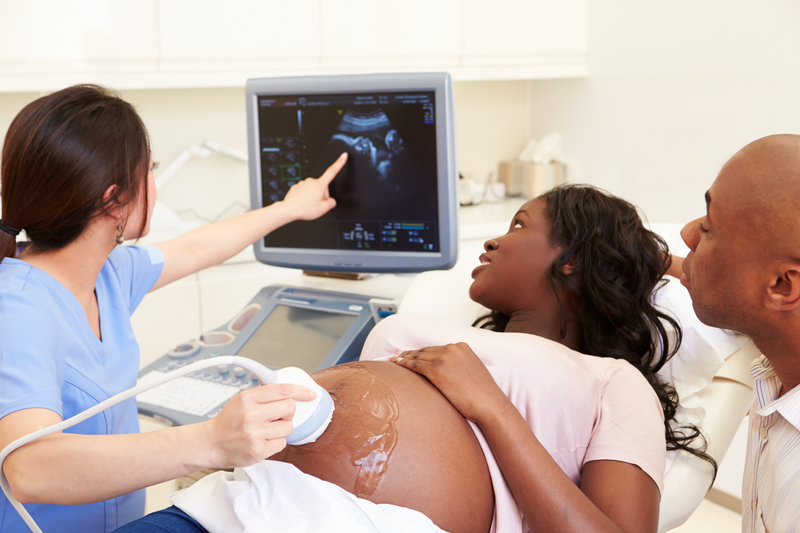 Prenatal diagnostic tests can catch certain disorders before a baby is born. Amniotic fluid index measures how much amniotic fluid you have in your sac—or bag as some people say—using ultrasound. How well your baby is doing and how well your placenta is working is considered during this screen, which can happen at any time in pregnancy. Most pregnant women have between 8–24 cm of amniotic fluid. Less than 5 cm means you don’t have enough amniotic fluid. Daily kick counts This is an important screen you can do any time from 28 weeks on. You simply count how many movements, or kicks, baby is making in a specific period of time. Put your hands on your abdomen and count baby’s movements during a 1-2 hour timeframe. Note how many times baby moves. Ideally, as many as 10 movements can be felt in a 2-hour period. If at any time you don’t think your baby is moving, try drinking a glass of cold water and focus on kick counting for the next 2 hours. You can stop when you get to 10 kicks in less than 2 hours. Call your healthcare provider anytime baby’s movements get less frequent. Maternal serum alpha-fetoprotein (AFP) multiple marker screening. These blood tests measure AFP in your bloodstream. Increased levels can be a sign of neural tube defects like spina bifida, Down syndrome or other chromosomal problems, carrying more than one baby, or an incorrect gestational age as levels vary throughout pregnancy. A “triple marker screening” combines AFP, human chorionic gonadotropin (hCG), and estriol and compares the numbers with risks associated with your age at pregnancy to detect some genetic problems and neural tube defects. The quad screen adds inhibin-A to the triple marker screen to increase detection of Down syndrome to 80%. These screens are done between weeks 15-16 . Nonstress test uses electronic fetal monitoring to check on baby’s heart rate and rhythm and whether baby is getting enough blood and oxygen from the placenta. This is based on how baby’s heart rate regularly increases and decreases as baby moves. Abnormal heart rates and rhythms can be a sign of an emergency, requiring cesarean birth. If you have pregnancy complications such as high blood pressure or high blood sugar, if you’re carrying more than one baby at a time, or if you’re experiencing bleeding in pregnancy, you’ll be asked to consider this screen. It’s the most widely accepted screen for checking on baby. Amniocentesis is used between weeks 15-20 to check for genetic disorders common in families, birth defects like spina bifida and chromosomal problems. A very thin needle is inserted to withdraw a small amount of amniotic fluid for testing. This test carries a small miscarriage risk (1 miscarriage in every 300-500 procedures). Chorionic villus sampling (CVS) CVS is performed between weeks 10-13 to test for any fetal problems caused by genetic disorders. It can also test for cystic fibrosis. In CVS, a sample of tissue is taken from the placenta for testing. When CVS is performed by an experienced health care provider and in a facility that does a lot of these procedures, the risk of miscarriage with CVS is about the same as the risk with amniocentesis. A blood test may also be needed between weeks 16-18 to screen for neural tube defects. Glucose Tolerance Test (GTT) shows how well your pregnant body is managing blood sugars and if you’re developing gestational diabetes. The initial test happens between weeks 24-28 and it measures your blood sugar level one-hour after consuming a measured sugary drink. If that result isn’t normal, you’ll likely be asked to take the 3-hour challenge, which also measures your blood sugar levels by the hour through the test. Group B Strep culture determines if you’re among the 1 in 4 women with these bacteria in your lower genital tract. These otherwise harmless bacteria can cause a severe infection of your placenta in pregnancy plus postpartum infections for you and baby. It’s also the most common life-threatening infections among newborns. The CDC recommends all women be tested for Group B strep between weeks 35-37; antibiotics are used to treat any infection. Ultrasound uses sound waves to visualize baby in your womb. This is where you’ll “see” baby for the first time before birth. It’s the most common diagnostic test in pregnancy. During an ultrasound, your baby will be measured to make sure baby is the right size for the particular week of your pregnancy, if baby is developing well and moving or functioning well, and if your amniotic fluids are normal and your placenta is functioning well. Alternative & Homeopathic Remedies in Pregnancy: What’s safe, what’s not?